Beautiful Croatian coast dotted with thousands of islands is a great for unforgettable sailing holidays. Sailing holidays can be organised or you can book your own sailing or motor boat to explore hidden beaches, caves and relax onboard. Croatian coast offers a gorgeous mix of islands with quiet villages, hidden harbours, fortress towns, secluded bays and crystal clear seas. Sailing holidays on a sailing boat is ideal for those who travel as family or with a group of friends. If you are qualified sailor you can choose your own route, sailing from harbour to harbour and enjoy beautiful blue skies and the warm Mediterranean sun. If you are not a sailor, you can charter a boat with a skipper which drives the boat and give you the advise on the ports, best restaurants and great spots for swimming and snorkeling. You will simply relax and enjoy yourself. The best area for sailing is Croatian coast from Trogir to the south. There are seven large islands and numerous medium to small ones that offer a contrast of lively harbours, imposing fortress towns, restaurants, bars and small bays, hidden coves. The largest islands in Dalmatia are Solta, Brac, Hvar, Vis, Lastovo, Korcula and Mljet. Hvar is among the most popular one with cosmopolitan party wotn with direct ferry links to Split and mainland. One mile from Hvar lies a small archipelago called Pakleni islands, offering an idyllic haven for yachties with numerous peaceful and relaxing bays in which to anchor. There are plenty of other hidden gems as well. Look for Stiniva bay on Vis, Maslinica on Solta and Pasadur on Lastovo. Along the coast you will find yacht bases: Trogir, Kastela Marina, ACI Marina Split, Solta and Dubrovnik. The first four of these bases are in very close proximity to each other in the north of the Dalmatian islands and aren't more than 30 minutes from Split airport. Dubrovnik stands alone in the very south of Croatia. Marina is 40 minutes from the airport. For those who likes to meet new people organized sailing trip is ideal choice. You will find many choices for this kind of holiday. The most popular route are those between Split and Dubrovnik, meaning your trip starts in one of the cities and stops along the way on the islands in between (Hvar, Brac, Korcula, Mljet). G Adventures is a small group adventure travel company that offers affordable small group tours, safaris and polar expeditions. In Croatia among other tours G Adventures offers several small group sailing tours on which you will sail onboard small yacht and discover charming villages, hidden bays and historical cities. You will enjoy relaxing, sunbathing, swimming, partying, hiking and sightseeing beautiful Croatian coast and islands. Busabout is a UK-based company that offers organized tours and sailing holidays throughout the world. Their trips are made for 18-35 years old travellers. 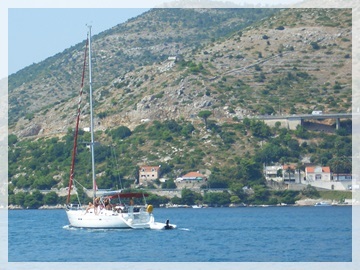 In Croatia they offer a range of sailing trips which are combination of summer sports, fun and sightseeing. Some trips include visits to popular summer beach festivals.